Maria Ramona Vargas Penzz, 76 of Ocoee, Florida passed away April 5, 2019. 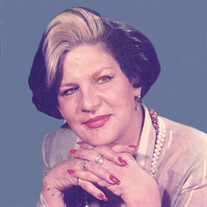 Maria Ramona Vargas Penzz was born April 29, 1942 in Cumana, Venezuela to Fabian Vargas and Carmen Penzz. The family of Maria Ramona Vargas Penzz created this Life Tributes page to make it easy to share your memories. Send flowers to the Vargas Penzz's family.